The guide is no longer available. Do you have a good grasp of the basics of predictive astrology and want to go further? The next logical focus is to gain an understanding of progressions, returns, and the basic steps of making predictions. If you want to embark on that step, this guide is for you! 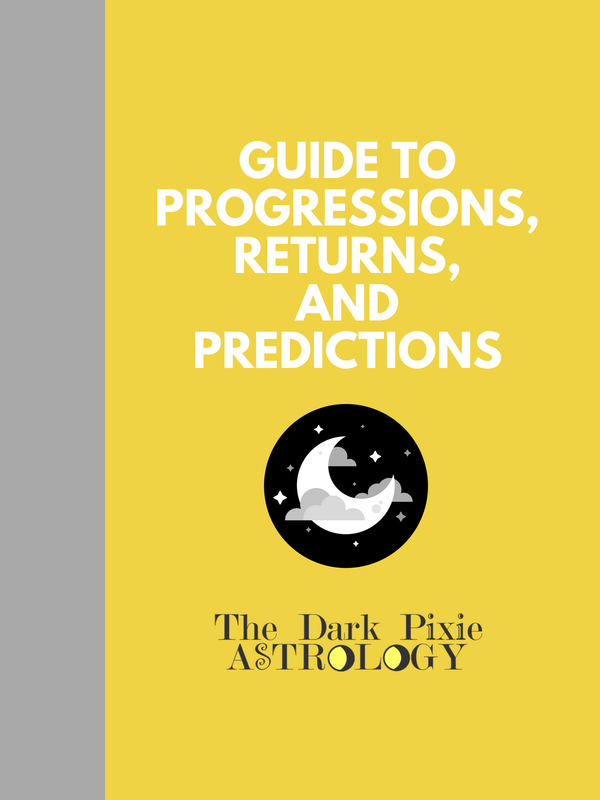 The Guide to Progressions, Returns, and Predictions gives you the frame work you need to dissect your progressed chart and use it in your predictive work, understand your return charts and how they can work for you, and what you need for making predictions. There's no fluff, only what you need to get started. The appendix also contains a list of rulers for over 400 aspects of life, which comes in handy when you're making predictions on your own. And you get a bonus e-book of over 40 predictive astrology articles from over the years on the blog and newsletter you'll be able to use once you get a handle on how predictions work. The progressed chart adds one day to your date of birth for every year you've been alive to create a new chart. This chart reflects your maturation as growth, and can be a very helpful tool to use in prediction along with your natal chart. It gives you more to pull from. Return charts are charts for the moment a transit planet returns to the exact position it was at when you were born. The return chart provides information about that specific return, and is another helpful tool in predictive analysis. Transits to the natal chart are the beginning in your predictive astrology journey. Tracking progressions and returns is the next step to widen your predictive knowledge. If you're ready to get going, then go! ​Note that the information in this guide is based on info in the Becomes a Predictive Astrology Savante-book and Predictive Astrology Course/Program, so if you got those, you don't need this.